Astronomers have detected X-rays from the remains of a supernova that was first seen from Earth over 50 years ago. This supernova was dubbed SN 1957D because it was the fourth one detected in the year 1957. While detected in the radio and optical for decades, SN 1957D did not appear in previous X-ray images. Astronomers needed a long observation (8.5 days) from Chandra of the spiral galaxy where SN 1957D is found to finally detect it. The Chandra data suggest a rapidly rotating neutron star was formed by the explosion, which would be one of the youngest objects of this type ever observed. Over fifty years ago, a supernova was discovered in M83, a spiral galaxy about 15 million light years from Earth. Astronomers have used NASA's Chandra X-ray Observatory to make the first detection of X-rays emitted by the debris from this explosion. Named SN 1957D because it was the fourth supernova to be discovered in the year of 1957, it is one of only a few located outside of the Milky Way galaxy that is detectable, in both radio and optical wavelengths, decades after its explosion was observed. In 1981, astronomers saw the remnant of the exploded star in radio waves, and then in 1987 they detected the remnant at optical wavelengths, years after the light from the explosion itself became undetectable. A relatively short observation -- about 14 hours long -- from NASA's Chandra X-ray Observatory in 2000 and 2001 did not detect any X-rays from the remnant of SN 1957D. However, a much longer observation obtained in 2010 and 2011, totaling nearly 8 and 1/2 days of Chandra time, did reveal the presence of X-ray emission. The X-ray brightness in 2000 and 2001 was about the same as or lower than in this deep image. 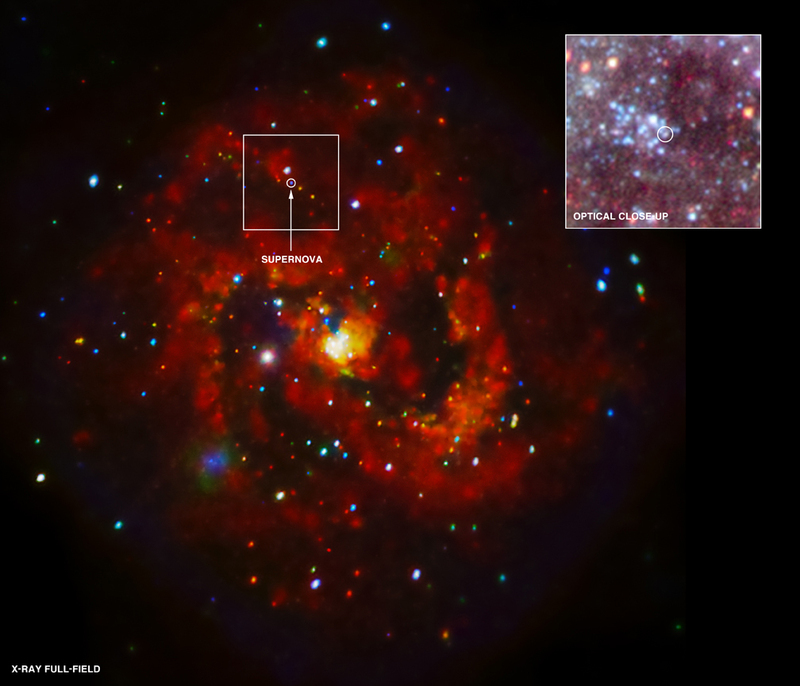 The new X-ray data from the remnant of SN 1957D provide important information about the nature of this explosion that astronomers think happened when a massive star ran out of fuel and collapsed. The distribution of X-rays with energy suggests that SN 1957D contains a neutron star, a rapidly spinning, dense star formed when the core of pre-supernova star collapsed. This neutron star, or pulsar, may be producing a cocoon of charged particles moving at close to the speed of light known as a pulsar wind nebula. If this interpretation is confirmed, the pulsar in SN 1957D is observed at an age of 55 years, one of the youngest pulsars ever seen. The remnant of SN 1979C in the galaxy M100 contains another candidate for the youngest pulsar, but astronomers are still unsure whether there is a black hole or a pulsar at the center of SN 1979C. An image from the Hubble Space Telescope (in the box labeled "Optical Close-Up") shows that the debris of the explosion that created SN 1957D is located at the edge of a star cluster less than 10 million years old. Many of these stars are estimated to have masses about 17 times that of the Sun. This is just the right mass for a star's evolution to result in a core-collapse supernova as is thought to be the case in SN 1957D. Multipanel with Optical, H-alpha & X-ray. These results will appear in an upcoming issue of The Astrophysical Journal. The researchers involved with this study were Knox Long (Space Telescope Science Institute), William Blair (Johns Hopkins University), Leith Godfrey (Curtin University, Australia), Kip Kuntz (Johns Hopkins), Paul Plucinsky (Harvard-Smithsonian Center for Astrophysics), Roberto Soria (Curtin University), Christopher Stockdale (University of Oklahoma and the Australian Astronomical Observatory), Bradley Whitmore (Space Telescope Science Institute), and Frank Winkler (Middlebury College). NASA's Marshall Space Flight Center in Huntsville, Ala., manages the Chandra program for NASA's Science Mission Directorate in Washington. The Smithsonian Astrophysical Observatory controls Chandra's science and flight operations from Cambridge, Mass. Observation Time 219 hours 49 min. Great reference for astrophysical discoveries. A young supernova remnant in the spiral galaxy M83, which is located about 15 million light years from Earth. 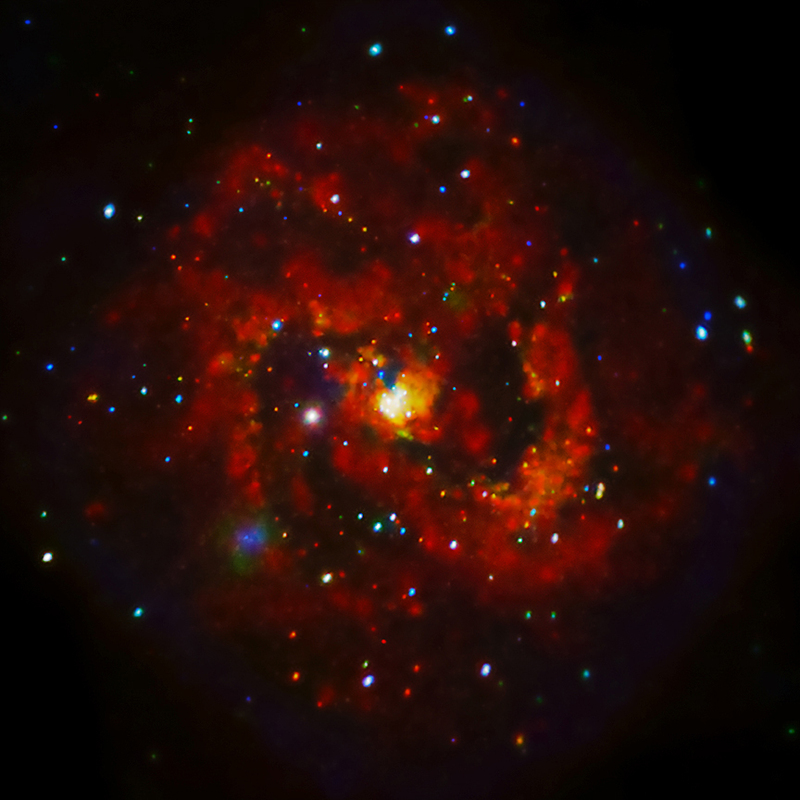 X-rays from Chandra & Optical from Hubble. 9.5 arcmin on a side (~41,000 light years); Inset image: 1.6 x 1.3 arcsec (~120 x ~100 light years). X-ray: (Red, Green, Blue); Optical inset (Red, Green, Blue).